s a graduate of the London School of Economics, Christopher Ruddy, the founder and CEO of Newsmax Media, knew the dirty little secret of the financial world: that the investing advice available to the "one-percenters" was drastically superior to what was available to the other 99 percent of the population. That’s because the "one-percenters" could afford the cream-of-the-crop experts — their own international bankers, global money managers, and asset protection advisers — to guide them in their financial endeavors, allowing them to live their luxurious lifestyles. Meanwhile, the vast majority was stuck gathering piecemeal information on the stock market from misinformed friends or family members, or perhaps worse yet, from mainstream media outlets who are more concerned with ratings than giving the in-depth discourse that would truly benefit an investor. So at the turn of the millennium, Mr. Ruddy struck forth on a mission to level the playing field. He decided to gather those same financial experts who advise the "one-percenters" and provide that same valuable information to readers just like you. At that moment, the Financial Braintrust was born. Made up of some of the top financial minds in the world, including internationally renowned scholars, economists, titans of industry, and political strategists, he asked them to share all of the same winning ideas and recommendations they provided to their exclusive, high-paying clients. 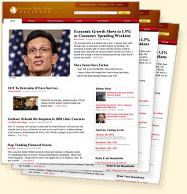 That formation led to the launch of a groundbreaking financial newsletter, The Financial Intelligence Report, in September 2003. Unlike many other financial newsletters with a narrow focus, The Financial Intelligence Report is geared toward all-around investors who want to know about stocks, bonds, real estate, commodities, precious metals, and more . . . and how to grow or protect their wealth from political and economic changes that lie ahead. Since its inception, the results have been nothing short of fantastic. The Financial Intelligence Report "Braintrust" has predicted every major economic and market trend since its very start. Events like the Great Recession . . . The December 2007 issue headline warned "2008: The Year of Reckoning" while nearly everyone else was saying "buy, buy, buy." The next year the market nearly lost 50% of its value. The rise in gold prices . . .
Back in December 2003 our gold experts predicted a massive spike in gold prices. Had you been a subscriber and bought gold at that time — when it was trading for just $400 an ounce — your gold holdings would have quadrupled in value! And finally, the latest bull market . . . In February 2009, one of our experts made this call: “We soon should be in a market rally that lasts anywhere from six months to two years. During this period, the Dow could regain anywhere from 50 to 100 percent of its losses, which would mean a Dow ranging from 10,500 to 12,000 in the coming 24 months.” As you know, the market hit bottom the very next month, and went on a historic rally that continues to this day. By having access to this information before these events occurred, readers of The Financial Intelligence Report had the chance to safely position themselves to avoid the devastating consequences, and actually profit from the unique opportunities presented by our expert panel. And that was Christopher Ruddy's goal all along . . . to provide readers like you with sound financial advice they ordinarily wouldn't have access to, so that they can protect and grow their wealth for years to come. Since then, Mr. Ruddy decided to expand the power and reach of those experts who contribute to The Financial Intelligence Report by giving you access to his Financial Braintrust, as led by Editorial Director Andrew Packer. Exclusive editorial insights into markets and investing. In consultation with the Braintrust team, Andrew Packer provides news, analysis and recommended trades, so that you can act on market trends and breaking opportunities in real time. Three confidential investment portfolios available only to Braintrust members.Our three portfolios are built for various investing goals. The flagship Braintrust Core Portfolio offers a value-based buy-and-hold approach; the Aggressive Portfolio targets stocks further out on the risk spectrum, but that also have more potential upside; and the Options Portfolio, which gives easy-to-follow guidance on buying and selling specific calls and puts. Bonus reports from the full family of Newsmax financial newsletters. As a member of the Braintrust, you will receive the bonus reports each member of the Braintrust writes. You will instantly be privy to more than two dozen intriguing reports that are valued between $19 to $49 each. The Financial Braintrust is an opportunity to immerse yourself in the world of international bankers, global asset managers, astute financial authors, leading business advisers, seasoned currency analysts and traders, tax specialists, and asset protection advisers — and use this broad network of experts to invest like a “one-percenter” and avoid dangerous pitfalls that can destroy your wealth. Join Andrew Packer today to gain an edge on maximizing your returns and investing for the long run. To learn more about joining the Braintrust and to gain access to our investing experts, archive of monthly issues, exclusive conference calls, and all of our special investment reports, click here.